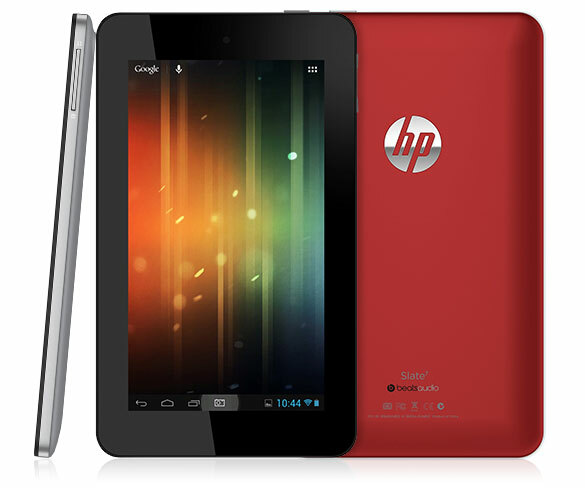 In Barcelona, at Mobile World Congress, HP just unveiled their first ever Android tablet, the Slate 7. The device carries a 7″ display, has access to Google Play and the rest of Google’s suite of apps, weighs 13 ounces, utilizes Beats audio, is powered by a 1.6GHz dual-core processor, 3MP rear camera, VGA front camera, runs Android 4.1, and drops in at a ridiculously low price of $169. The device will be available in April of this year. With a 7-inch diagonal screen and weighing 13 ounces, the HP Slate7 is an ideal trusted personal companion, featuring a stainless-steel frame and soft black paint in gray or red on the back. It also is the industry’s first tablet to offer embedded Beats Audio, for the best-sounding, richest audio experience available on a tablet. The HP Slate7 joins the recently introduced HP Chromebook as part of HP’s push to offer access to the Google experience. HP’s tablet offerings reside in the company’s newly formed Mobility Global Business Unit, established in September 2012 with the hiring of Torres. Torres joined HP from Nokia, where he was executive vice president and oversaw the MeeGo products and platform.